In search of powerful weapons to wield against the Storm Tyrant, the adventurers follow a map found in the lair of the hill giant Grenseldek, which leads them to the tomb of legendary giantslayer Nargrym Steelhand. Armed with these weapons of legend, the adventurers then head into the treacherous Mindspin Mountains in search of the valley where the Storm Tyrant is recruiting giants for his army. The heroes must sneak past the legions of giants inhabiting the winding valley before making their way to the horde's headquarters - an ancient temple dedicated to the giant god Minderhal. Once there, they must awaken a mighty artifact and disband the mustering army before the giants can be unleashed on the world! "Forge of the Giant God." 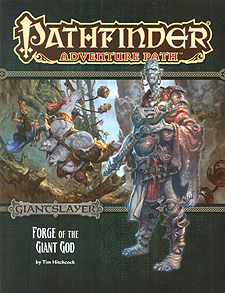 a Pathfinder adventure for 7th-level characters, by Tim Hitchcock. A gazetteer of the Mindspin Mountains, one of Avistan's largest mountain ranges, by Mark Moreland. A close look at the faith of the giant god Minderhal, by Sean K Reynolds. A tale of escape and trickery inthe Pathfinder's Journal, by Greg A. Vaughan. Four new monsters, by Benjamin Bruck, Tim Hitchcock, and Sean K Reynolds.